Back in the late ‘80s, Excalibur was one of my favorite members of the X-Men family. Chris Claremont and Alan Davis were collaborating on something special, a superpowered team with a lighter take on their adventuring. The team actually felt like a group of siblings, the way they got along together and shared a friendly dialog. It was a wonderful change of pace from the angst-ridden main X-Titles of the day, and I still remember the issues fondly. This new series is a near-direct continuation of those stories. 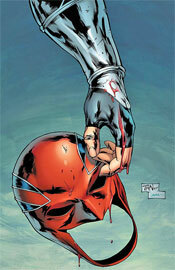 The team is still led by Captain Britain, but if this issue is any indication, the similarities end there. Chris Claremont’s writing has never seemed as outdated as it does here. His cast is entirely emotionless, calmly speaking in a presumably dull monotone while they tear apart downtown London. It’s all business, no emotion, all the time. Nobody seems worried about the havoc they’re wreaking in one of the world’s most identifiable cities, it’s like they’re completely emotionally detached, no matter which side they’re on. Add that to a plot that’s so overly convoluted that I still have no idea what the hell was going on. I know there was a big throw-down in the city, I recognized a few faces, but I don’t know what they were trying to do, who I was meant to be rooting for, what was going on beneath the surface or why the fight was happening in the first place. Despite what I’d consider to be more than a passing knowledge of the X-universe and four paragraphs (!!!) of “previously in New Excalibur” intro copy, I remain at a complete loss. This book has too many characters, too many storyline twists and too many intricate details for any mortal man to follow. I’m sure that in the depths of his own imagination, Claremont is telling an epic, scene-altering story that makes perfect sense when you sit down to think it all over, but in practice it leaves his readers utterly dumbfounded, lost without a map. The writer sees to it that no two individual characters have distinct personalities, just different powers to talk about – and talk they do, incessantly, endlessly, until the panels overflow with needless chatter. If their use had been properly introduced to the proceedings, Dazzler wouldn’t need to tell me exactly what she’s doing with her mutant abilities. The Juggernaut shouldn’t have to say “What the – I’m goin’ straight back up on a platform of ice!” The artwork should make it obvious enough. But it doesn’t. Jeremy Haun’s pencils straddle the line between too detailed and too simplified, taking some of the worst elements from both. He has an ongoing struggle with perspective, ruining a “test of strength” panel by failing to reveal the actual size of the statue one character lifts above his head. His posturing is repeatedly stiff, awkward, rigid and lifeless. He takes the natural drama out of a scene by detailing the wrong areas of a panel, drawing the focus away from the spectacular and towards the mundane. How do you spoil the timeless comic book scene of a superhero effortlessly flying above a cityscape? By focusing so exclusively on the dull buildings in the backdrop that the character himself is lost amongst the details. This just isn’t a good book. Chris Claremont butchers a simple firefight with too much information, too much dialog and not enough old-fashioned firepower. His partner in crime, Jeremy Haun, doesn’t help matters with a lame duck style and soulless main characters. If you’re into bad art, bad dialog, an abundance of thought balloons and a cast of uninspiring characters, this is exactly what you’re looking for. Otherwise, please do yourself a favor and skip this. It’s awful.